When I finally opened Mastering the Art of French Cooking, Vol. One and got cooking, I couldn’t stop with just one dish. I wanted a dessert from the book to serve after our meal of coquilles st. jacques. I looked through the desserts and cakes chapter and paused at the flan des isles but decided I’d rather try a cake. The babas and savarins I will definitely come back to in the future, but they weren’t exactly what I wanted for this meal. 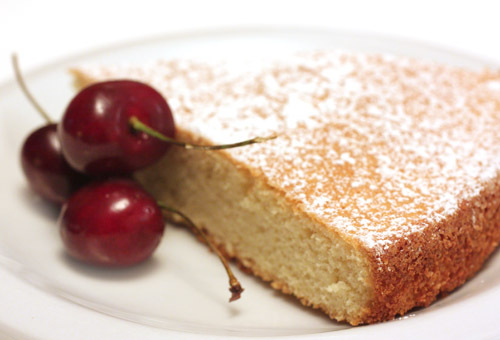 Then, I arrived at the biscuit au beurre described as a “fine, light spongecake [which] may be served with a sprinkling of powdered sugar, and goes well with tea, or with fruits.” A nice, simple cake with fresh, summer fruit sounded perfect. At the end of the recipe, there are three optional toppings. The first, which I chose, is to simply shake powdered sugar over the cake. The second was an apricot glaze with almonds, and the last was a buttercream icing which could be made chocolate. There are actually suggested variations for serving all of the cakes in the chapter which shows how versatile they are. 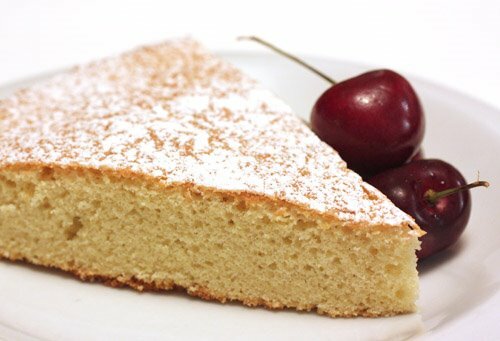 This is a classic sponge cake and contains only egg whites for leavening. You begin the recipe by melting butter and letting it cool. Sugar and egg yolks were then mixed together, and vanilla was added. Egg whites were whisked with salt, sugar was added, and they were whisked to stiff peaks. Then, the folding and sifting began. 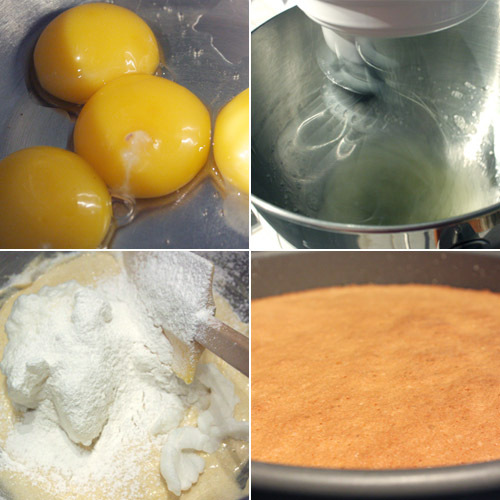 Some egg whites were added to the yolk mixture and some cake flour was sifted on top. This was folded until partially blended. Then, the same process was repeated with more egg whites and more flour. It was repeated once more, but before completely blending everything together, the melted butter was added. That seemed odd to me. I wanted to add that butter much earlier, but it went in at the end and I’m not sure why. The cake baked in a ten inch pan for about half an hour and then cooled on a rack. It was a little difficult to wrangle it out of the pan, but I managed to do so without destroying it. As promised, it was light with a springy airiness about it, and the butter and vanilla gave it nice flavor. The sprinkling of powdered sugar was just enough embellishment. I served the cake with fresh cherries, and that was a happy combination. It’s also mentioned that this cake works well as strawberry shortcake, and I’ll definitely use it that way too. Like so many recipes in this book it’s simple, classic, versatile, and most importantly really good-tasting. Why did I wait so long to start cooking from this book? I'm a big fan of non-frosted cakes, and you served it with my favorite fruit, cherries! Gotta love the butter. Whoever invented the stuff is genius! lol. I still need to get me a copy of Mastering the Art of French Cooking. Que ca a l'air bon!!!! It looks sssooo good! This looks so heavenly and beautiful. Gorgeous shots! simple and classic is best which I guess is why we keep going back after we've strayed. The cake looks scrumptious! buttery breads are divine! Great photos with the cherries! Looks like the perfect cake, and I love the dusting of powdered sugar on top! Oh my I have to make that cake. Sounds perfect with a strawberry coulis and whipped cream. Love the picture with cherries. A delicious cake! It pairs wonderfully well with fruit compotes and ice cream! Sounds very French... love it. That looks lovely for a summer dessert...light and airy...beautiful! Beautiful cake! The color and texture look delightful! anything that can enhance the glory of the already-magnificent strawberry shortcake is welcome in my kitchen. looks great! Using it as a strawberry shortcake sounds right up our alley. This looks like a delicious cake to have for a weekend breakfast/brunch or for a snack with a cup of tea! Especially with fresh fruit! Julie Child always loved butter, and made no excuses for that. You have to love a woman for being true to herself like that. oh my! this looks yummy! I thought your recipes couldn't get any better after your last post. But no. I want to eat my screen. Love the sound of the apricot glaze on the light sponge cake! Beautiful picture. This cake looks just perfect. I personally, do not like cakes with frosting but prefer cakes like this. I really enjoy making cakes leavened with nothing but egg whites. A bit more challenging than other methods but you always learn something new with each bake.